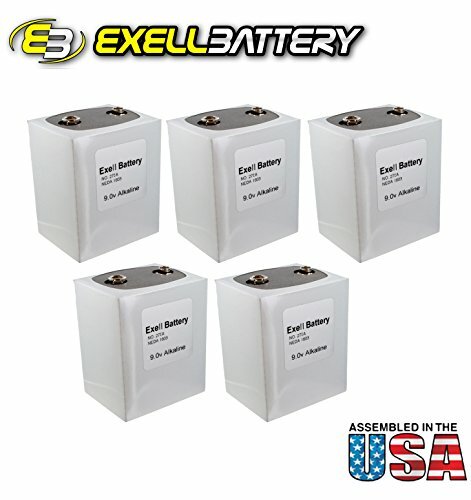 5x Exell 276 9V Alkaline Battery NEDA 1603 Eveready 276 Replacement Exell Batteries not only provide consumers with high efficiency, long-lasting performance, they also function as replacement batteries for an array of common and unique applications. Ranging from vintage camera equipment to sophisticated medical testing equipment, Exell Batteries can meet the needs of all consumers.The 276, or PP9, has larger snap connectors than the popular PP3 9V battery. It is used in a wide variety of meters, vintage radios, medical equipment, fire alarms/detectors and other devices.• Type: Alkaline• Voltage: 9V• Depth: 51.5 mm• Width: 65 mm• Height: 80 mm• Connector: Press Stud Full-Size Snap ConnectorsAlso Known As: 276, 439, 6419, 6F100, BB29, D6, DT9, GP1603S, M1603, M6, MN1603, P88, PB6F100E, PP9, RR9, ST9, T6009, TR9, VS306, VT9, Z276Battery Model 276 fits the following products: Manufacturer Model BUSH TR130 BUSH TR82C ROBERTS R250 ROBERTS R550 ROBERTS R757 ROBERTS R760 Also compatible with other models not listed.SpecificationsBrand: Exell Output Voltage: 9V Amperage: 4800mAh Chemistry: Alkaline Height: 80mm Width: 65mm Country of Manufacture: U.S.A.